This fine collection of recordings was released some time ago but in its tribute to one of Decca's giants of singing, it remains a great tribute. Mario del Monaco may have his detractors across the board but he is also widely lionized for that powerhouse of a voice that thrilled capacity audiences and millions of record listeners for almost three decades. It would be rather ponderous to enter into detail when faced with almost a hundred numbers but it may suffice to say that every one of the five CDs on offer gives us a particular brand of enjoyment. Be it the famous arias from Verdi's operas, or the wonderful silky sound in 'E lucevan le stelle' from Puccini's Tosca to the more homely 'Musica Proibita' by Gastaldon and other classic Neapolitan songs, the voice is there to savour and treasure at all points. Del Monaco's versatility is also apparent in various works which we do not normally associate him with such as Catalani's 'Loreley', Puccini's 'Il Tabarro', some Wagner (Lohengrin) and even a smattering of French opera from Bizet and Meyerbeer amongst others. The collection includes a large number of Italian songs and under the masterful direction of Ernesto Nicelli and Mantovani, the voice is coaxed to reach sublime heights of inspiration. The recordings vary in quality spanning the last years of the mono era to the late 60's where Decca's technique was almost perfect, it's hard to hear such fine opera recordings even today. 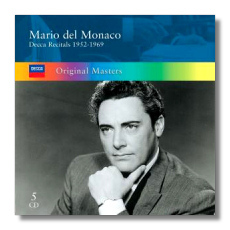 Lovers of opera and great voices alike should definitely acquire this fine memorial to one of the greatest tenors of the post War era, Mario del Monaco.